When David Ayer signed on to do a Suicide Squad film for Warner Brothers, the lay of the land was very different. Suicide Squad was meant to be a weird little film in the fringes of DC film continuity and a chance to play with the idea of villains forced into the role of indentured government servitude. Warner Brothers believed they had a worldwide mega blockbuster in Batman v. Superman: Dawn of Justice that would establish a grounded, gritty, and realistic tone to their films not unlike Christopher Nolan’s The Dark Knight Trilogy moving forward for their comic book film slate. While Batman v. Superman: Dawn of Justice was a successful film, it was not the juggernaut the studio believed and critical backlash pushed the studio to change the overall tone of their subsequent films to course correct towards a more light-hearted and relatable tone. At that point, Suicide Squad found itself in a very odd position. Suddenly, this weird little movie became a very important lynch-pin to the DC film strategy; it had to be a bellwether to fans signalling to the world that DC “gets it” and was fixing things moving forward. But Suicide Squad also has a bigger role; its plot and story heavily deal with the politics of meta-humans as WMDs in a post-Superman world and also introduce the heavily paranormal side of the DC Universe at the same time. With so many pieces to juggle, its not all that surprising that while the film gets a lot right, the film heavily struggles in terms of coherence and finding its overall tone. From the start, the film lapses right into heavy exposition. We’re introduced to Amanda Waller (Viola Davis), the head of a government black ops force called ARGUS who control a GITMO-esque black site prison called Belle Reve in Louisiana. It is here that the worst of the worst; criminals with meta-human abilities are collected and kept in a gulag for Waller’s ultimate purpose. That purpose being to serve as an expendable assault force against the potential of another Superman-like figure showing up and causing untold damage. Waller’s group, called Task Force X, would be the WMD to use against any would be space-faring conquerors. To that end, Waller introduces her first recruit Dr. June Moone (Cara Delavigne), an archeologist who, due to exposure to an ancient ruin. is the host for a 6,000 year old being called Enchantress. Waller can control Enchantress via access to her disembodied heart, which she uses to get Enchantress to retrieve some WMD plans from Iran convincing the Joint Chiefs of the group’s viability. Waller’s draft picks include Deadshot (Will Smith), the world’s best assassin, who is captured by Batman (Ben Affleck) after an ARGUS tip-off. Captain Boomerang (Jai Courtenay doing his best Tom Hardy impression), a Central City rogue captured by The Flash (Ezra Miller). Katana (Karan Fukuhara), a deadly martial artist with a mystic sword that eats souls who serves as a bodyguard to the head of the Squad, Rick Flag (Joel Kinnaman). Killer Croc (Adewale Akinnuoye-Agbaje), a mutated cannibalistic crocodile man; as well as Diablo (Jay Hernandez), a former gang banger turned fire elemental, and Slipknot (Adam Beach), a guy who can climb anything. Last and certainly not least is Harley Quinn (Margot Robbie), a psychotic ex-psychologist at Arkham Asylum who became the object of obsession and eventual paramour of Batman’s arch-nemesis, The Joker (Jared Leto). Waller keeps these world-be heroes in line by means of a lethal explosive developed by Wayne Industries that will ignite if they disobey or fail to follow through on their mission. Their mission is a big one; to extract a high ranking official from a so-called terrorist situation in the heart of Midway City. The only problem; its clear that this isn’t a terrorist situation due to the giant tower of energy being directed into the sky with a floating orbit of debris around it. It is here that this suicide squad has to make their stand; whether to cut and run or prove that they really are heroes. Meanwhile, The Joker wants his Harley back and will go to any means to retrieve her; even if it means finding Belle Reve and the means to disable her neck bomb. Right off the bat, this is a lot of storytelling baggage and heavy storyline and character beats for any movie to handle and establish firmly; let alone one with an ensemble cast from various comic book franchises. Ayers’ film starts off with heavy exposition throughout the first hour with on screen graphics trying to establish these various’ characters personalities and backstories while keeping a light tone using bright colors. Its clear that Ayer looked at the DCU Animated Suicide Squad film, Batman: Assault on Arkham, to crib this shorthand and it does help. However, the films editing and slipshod narrative structure tip off a lot of story beats (i.e., if a character didn’t get a fancy intro sequence at the start of the film, its a pretty solid bet that they don’t get too much story time and aren’t long for the Squad). Some fare better than others; Harley Quinn, Deadshot and Diablo get the meatiest backstories and arcs. Other characters like Killer Croc, Katana, and Captain Boomerang are defined by one or 2 traits and that makes up the bulk of their character (i.e., body positive crocodile, girl with a scar and a magic sword, drunken brony bogan). Of the crew, Jay Hernandez’ Diablo has the best redemptive arc and he does a lot with the role given that his face is hidden behind garish overdone skull tattoos. In many ways, his performance is the film’s most affecting and he becomes the defacto heart of the team. Will Smith’s Deadshot is also given a penance storyline; he wants to get back home to his daughter and to make her proud of him. Smith’s charisma does the heavy lifting in this film in terms of audience laughs and being the de facto “hero” of the team. The film benefits from having an engaged Smith in the role; one reminiscent of his earlier films like Bad Boys and Men in Black. 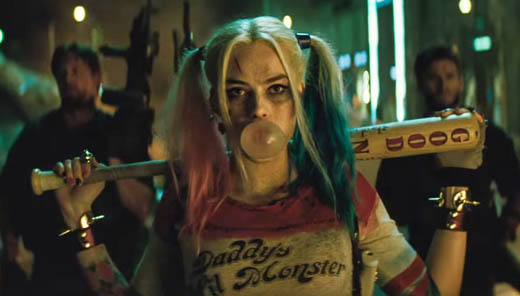 Margot Robbie’s Harley Quinn is going to be the draw for many to see this film. For many comic fans, her popularity rivals that of Deadpool; its only fitting they both make their big screen debuts this year. Robbie’s Quinn is a highlight of the film; much like Ryan Reynolds in Deadpool, Robbie is Quinn brought to life. She nails the character and her many comic book looks; including the red and black harlequin outfit which she does sport in a flashback scene in the film. Her casting is akin to Hugh Jackman’s as Wolverine; they got it right and she’s going to define this role from now on. David Ayer gives her a lot of agency on the film and she isn’t defined as the Joker’s sidekick, but as his equal partner in havoc and chaos. And now we get to the Joker as portrayed by Jared Leto. A lot has been made of the method acting employed by Leto to find the Joker within himself. On screen, his Joker is ultimately forgettable. His Joker voice ranges between doing lazy impressions of Mark Hamill, Jack Nicholson and Heath Ledger with various degrees of Scarface and David Bowie thrown in. Not once does he appear as effortlessly charismatic as Ledger; or as manic and compelling as Nicholson. The worst that can be said of a performance is that it is one that is lost in artifice and that is Leto’s Joker in a nutshell. In a world where Margot Robbie needs to be captivated by you to turn herself into Harley Quinn, Leto’s Joker is lacking. The best touch he makes as The Joker is the use of a smile tattoo on his hand to cover people’s mouths while delivering monologues, but its a case of been there and done that with too much attention to tattoos and dentures and not enough to subtlety. Fans of the Joker and Harley dynamic will enjoy their chemistry and fan service throughout the film. One of the bigger issues with the film is that we’re presented with the idea of Task Force X as one informed by a post-Superman world. Not one where the threats of Zod, Doomsday or the otherworldly machinations of Lex Luthor leave humanity woefully unprepared. The entire plot of Batman v. Superman: Dawn of Justice hinges on the problematic issue of Superman acting the exact same way as Task Force X, albeit without government control or sanction. That leads to the thought that if this is an interconnected world of films and continuity, that the central issue of Batman v. Superman: Dawn of Justice is one where the government wants Superman under their thumb solely as a WMD of their using, ala Miller’s The Dark Knight Returns or even a callback to Superman’s first encounter with the government in 2013’s Man of Steel. This is problematic if the tone DC and Warner want is one closer to the comics versus a grim and gritty one established in those films. Any frank discussion of Suicide Squad will have to touch on the fact that there are ham-fisted references to the events of Batman v. Superman: Dawn of Justice literally wedged in to make the film “fit” in the context of that film’s continuity to this film’s detriment, including a shot of a boy selling bootleg “Remember Superman” t-shirts on the street as Waller walks to a covert meeting pitching Task Force X to the Chairman of the Joint Chiefs of Staff. Superman is brought up as point of reference for what Task Force X would battle despite Zod and Doomsday being bigger threats or the analogy that it took multiple heroes to defeat Doomsday, so as to make a team seem useful. This is one of the issues of tone when you have a small movie do the heavy lifting to address issues with another film. Its clear that WB wants Suicide Squad to be its Guardians of the Galaxy, but there’s no cuddly Groot or real light hearted takeaway. Despite the film’s reshoots to supposedly add levity, the central theme of the film is criminals finding redemption through indentured government service. There’s nothing inherently wrong with that theme. Its done well and some characters, especially Diablo and Killer Croc, will likely find new fanbases due to this film. But that theme clashes with the bright neon pink and green Hot Topic theme that the marketing is selling. Especially one where the finale of the film isn’t one where the team takes on Joker or Batman, but rather a paranormal set piece straight out of 1984’s Ghostbusters. Suicide Squad is a fun film, with a lot of cool engaging characters and interesting themes. But, at the same time, its at war with itself in terms of what kind of movie it wants to be and that makes it kind of forgettable in the long run. It feels like a lot of it is lost in an editing bay somewhere and the film’s exposition heavy structure and messy editing belie a better narrative elsewhere that the audience didn’t get in this version. But I would love to see this team in a better adventure; one not caught in the aftermath of trying to clean up the tonal dissonance of Batman v. Superman: Dawn of Justice and the type of lighthearted comic book films Warner Brothers wants to make moving forward. Viola Davis’ Waller is amazing and commands the screen whenever she is on it. Robbie’s Harley Quinn is magnetic and seeing Harley Quinn and the Joker being chased down by Batman on the big screen is a total fanboy moment. Jay Hernandez should get a bonus for being the MVP of this team and Will Smith reminds us why he set the world on fire with great charismatic performances in the 90’s with this role. This Squad has great chemistry and would thrive in a movie that doesn’t have to bear the heavy load that Warner Brothers placed on it in terms of universe building. As an addendum, we also checked the film out in IMAX 3D in a later screening the same week prior to wide release. IMAX 3D tends to be WB’s go to for releasing the definitive version of the film on the 5 foot tall IMAX screen. 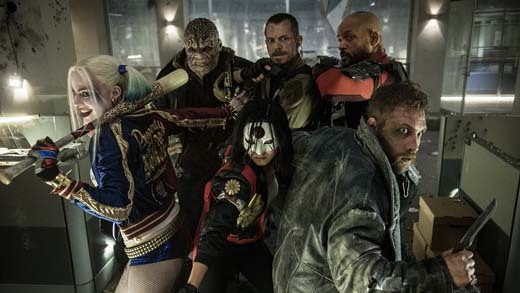 Suicide Squad was post-converted to 3D and as such, there’s not much the format adds to the film. There is a cool custom countdown to the film starting themed to the film and the WB and RatPac logos look cool in the format. But the format doesn’t really add too much. The post-conversion is murky and doesn’t really add much to the immersive sense of the film, versus something like 2014’s Guardians of the Galaxy, which was the definitive way to see that film. Hoeever, the IMAX movie poster giveaway for Suicide Squad is pretty awesome; its a cereal box themed poster with scratch and sniff effects on the Squad icon members faces with an exbossed raising of the letters. A pretty cool extra we were happy to get. Overall, we recommend 2D vs. 3D for those seeking the theatrical Suicide Squad experience. I guess visually it was a good movie other than it was all over the place!